For a better playback of a precious analog disk. Various phono cartridges can be used by MC transformer built-in. Model4 builds in the high performance and the high-quality sound transformer which used the permalloy core for MC cartridges. In Model4, many phono cartridges from MC to MM can be used. MC transformer is arranged at the nearness of the equalizer amplifier on the printed circuit board. By this arrangement, there is no degradation of the sound quality by long signal transmission. Three types of cartridge can be chosen with the switch on the front panel. MC High 0.5mV 40ohms DENON DL-103, Audiotechnica AT-33, etc. MC Low 0.2mV 10ohms ortofon MC-10,MC-20,MC-30,SPU, etc. 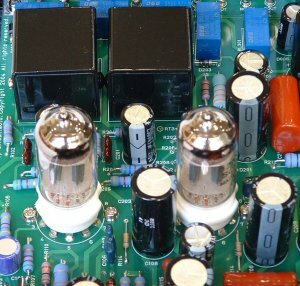 Model4 has a twice gain from the usual phono equalizer amplifier. Since there are few volume differences with digital equipment, such as CD and SACD, comfortable playback can be enjoyed. The muting button which cuts the noise at the time of record exchange or cartridge exchange. Record exchange and cartridge exchange can be performed without reducing volume control. Model4 has adopted CR type passive equalizer circuit suitable for a fine expression. Model4 play a delicate sound of an analog disk certainly. The non-feedback amplification circuit which combined vacuum tube 12AX7 and a MOS-FET buffer is used. This non-feedback amplification circuit is essentially low-distortion. And it has a natural tone. Furthermore, you can enjoy the warm soft tone of a vacuum tube. Exact reproduction is realized with the high precision RIAA equivalent characteristic. RIAA deviation : Less than 0.3dB (100Hz to 10kHz), less than 0.5dB(20Hz to 20kHz). Model4 reproduces the very small signal of MC cartridge finely by a quality vacuum tube and quality parts, and composition which eliminated noise thoroughly. Even use by the MC Low position realized low noise and a high S/N ratio. Low distortion was attained by improving the characteristic of an amplification circuit, without using for a negative feedback. 0.2%(No Compensation), 0.1% (400Hz highpass filter) at 1kHz, 1V output. Model4 uses low noise vacuum tube 12AX7LPS selected carefully. 12AX7LPS is the vacuum tube developed for low noise audio amplification circuits. Please look at Model4 technical description about an internal photograph, a circuit diagram, and detailed description. The price of Model4 is US$650 or 590Euro. RIAA equivalent error Less than 0.3dB (100Hz to 10kHz). Less than 0.5dB(20Hz to 20kHz). Distortion 0.2%(No Compensation), 0.1% (400Hz highpass filter) at 1kHz, 1V output.